On September 15, 1830, the age of the railroad began with the opening of the first line between Liverpool and Manchester. The locomotive that ruled those rails was George Stephenson’s Rocket. With a top speed of 45km/h (28mph) Rocket, was the most advanced engine of the day, and its arrival marked the beginning of the modern railway. 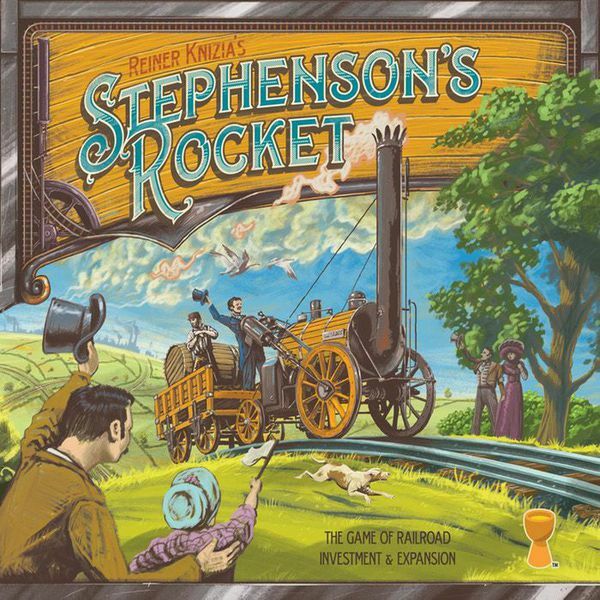 In Stephenson’s Rocket, players take on the role of rail barons in 1830s England. By investing in the various new rail lines, transporting passengers, and building up the local industries, players will vie for the honor of becoming the most prestigious rail baron in the early days of the steam locomotive. There are seven different rail companies that players can expand. Each time you extend a rail, the other stockholders can veto your action, but it might cost them their shares. When two companies' rail touch, the railways merge to become one. The game is over when only one company remains or there are no rail tiles remaining, and the winner is the player who earned the most money over the course of the game.